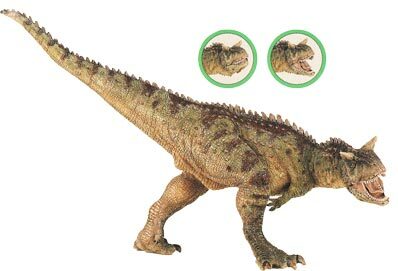 Since its launch just a few weeks ago the Papo Carnotaurus dinosaur model (Carnosauria) has been receiving a lot of complements with dinosaur fans and model collectors raving about this new Papo replica. The French manufacturer seem to have surpassed themselves with their interpretation of an Abelisaurid. We at Everything Dinosaur reviewed this model when it was first introduced, producing a written review and a short video about this new addition to the Papo “Dinosaures” range. Papo keep outdoing themselves with amazing models, and this Carnotaurus proves it. What surprised me is that the model itself is small, but filled with so much detail. The pose it is displayed in make it feel like a real animal on the prowl. The jaw moves as well, showing off a deadly set of teeth. This Carnotaurus is the best I’ve seen in a long time. Hopefully, Schleich’s will be just as good. Would definitely recommend. An amazing and beautiful model. Just some of the comments we thought we should share with our readers. Feedback like this is passed back to Papo and their design team, this helps them to continuously improve the models and replicas. Any suggestions as to future prehistoric animal models that Papo should make are also passed on by our team members. As many people think,this is a brilliant model.I would like to see a new Papo Apatosaurus model.I think a Sideshow-inspired Apatosaurus model would be awesome.Excellent release ,maybe one of the best of this year. Thank you for your comment, Papo have cut their teeth on Sauropods with the recently introduced Brachiosaurus, slightly smaller sculpts than the Brachiosaurus can be expected next year. tremendous.And non-dinosaurs?In recent years they’ve released marine reptils,as Tylosaurus .It would be nice to see Papo’s interpretation of Liopleurodon ,world’s largest predator creature ever lived.Thanks. Thank you for your input and comments, always appreciated.